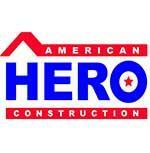 American Heroes Construction is looking to utilize sub-contracts for our jobs all over Central Florida. We need qualified sub-contractors for roofing, interior and siding. American Hero is a veteran owned and operated company specializing in providing new roofs to homeowners who have suffered storm damage. Our company culture is based around not just doing well by providing insurance restoration services, but to also do good in the community by providing jobs. We have a focus on providing jobs to veterans and those who have generously given to our community, thus "American Hero." In fact, over a third of our workforce is composed of veterans, former fire fighters, EMT's, and other community heroes.